Most of the open textbooks that have been fully funded, managed, and published by BCcampus during the initial phase of the open textbook project are hosted on on BCcampus’ internal instance of Pressbooks (opentextbc.ca). For each of these textbooks, there are stats available for how often the webbook is accessed and how often the files on the webbook’s home page are downloaded. These statistics are found under the “opentextbc.ca” tab on the Open Textbook Stats page. 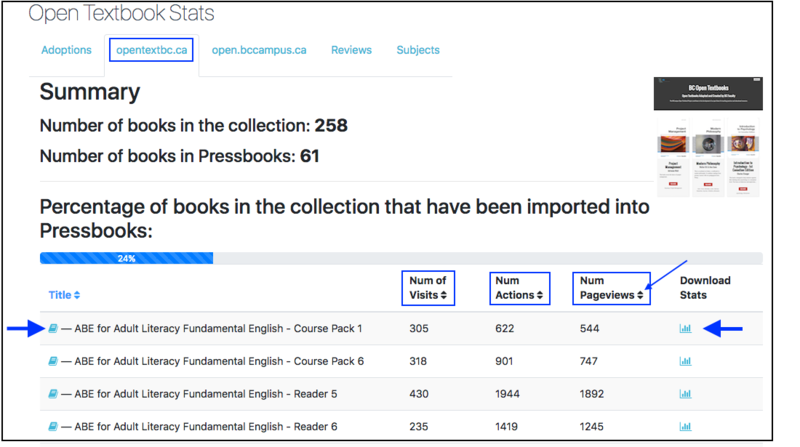 Like the stats provided for textbooks accessed directly through the collection, a Download Stats button is provided for each BCcampus-published book in the internal instance of Pressbooks. There is also a link to the book in the collection to the left of each book title. Listed by each book are also stats on number of visits, number of actions, and number of page views. Statistics for BCcampus Publications by Lauri M. Aesoph is licensed under a Creative Commons Attribution 4.0 International License, except where otherwise noted.